It's a fine line between co-op and coop--literally. We know, we know. Women are sometimes called hens. Chicks, too. 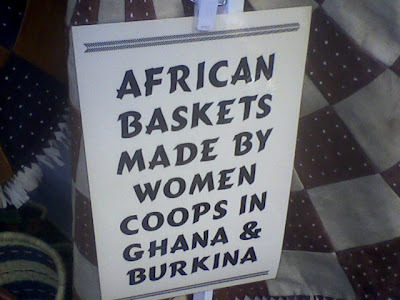 And we know that some dictionaries accept "coop" without the hyphen to refer to a cooperative business organization. We are also aware that Harvard's Bookstore is called the Coop, with this meaning in mind. It took us the better part of our undergraduate education to know it was a co-op, not a chicken enclosure. No wonder we didn't get into Harvard. Thanks to Becca for the photo, taken at Seattle's Folklife Festival (it's about music, not poultry). See, it's stuff like this that almost makes us hate nature. Thanks to Professor Greg for the photo, which was taken at a park in Eugene, Oregon. So much for no regrets! "Heroes" starlet Hayden Panettiere likes to show off the tattoo she has running down her left side, but it seems to have been misspelled. Often visible above her dresses for the first word, the tattoo in full reads "Vivere senza rimipianti," which is meant to be "to live without regrets" in Italian. Unfortunately for Hayden, her tattoo reads "rimipianti" instead of "rimpianti," adding an extra "i." To those of us who truly love words this is quite amusing even if it's off-topic. The Washington Post has an annual contest in which readers are asked to supply alternative meanings for common words. spilling plurals, disdaining the bottom line. you work alone, dark of a crescent moon. never exclaim, never tell anyone where to go. "No one ever attains very eminent success by simply doing what is required. It is the amount of EXCELLENCE of what is over and above the required that determines the greatness of ultimate distinction." Here is an example of something that is grammatical but is so convoluted we almost can't make sense of it. (The capital letters and unnecessary underlined words only contribute to the air of impenetrable urgency). We think the author is trying to say "You'll never be great unless you do more than you have to, and the more you do, the more distinguished you will be." But perhaps we're missing something. We would love to hear other translations of this motivational mishmash, though. Please send yours to info@spogg.org. If we get a really good one, we will make a classy motivational poster for our members to download, featuring an image of--oh, we don't know--an adorable kitten trying to fly a rocket. Linking verbs can be tough. There are the easy forms, such as "to be." These verbs link a subject to an adjective, which is why you say, "I am short" instead of "I am shortly." It's also why you say "I feel bad" instead of "I feel badly," unless you are, in fact, talking about your sense of touch. But there are sometimes subtler cases. For example, Joan Rivers got all pissy with someone on "Celebrity Apprentice" for saying, "I sat here and acted professional." Now, to SPOGG, to "act professionally" means to be paid for acting. One way to see if "act" is a linking verb here is to swap in another adjective. I acted tired. I acted angry. Both of those sound somewhat awkward to us, but preferable to "I acted tiredly," or "I acted angrily." We'd say, "I acted as if I were tired." Actually, we'd be more likely to write that. We'd be more likely to say "I acted like a professional" or "I acted professional." Therefore, we don't think Joan Rivers is right in issuing this correction. Nor are we a fan of all the plastic surgery, something that is entirely unrelated but must be said. Edit your language, friends, not your faces.